Hi, thanks for taking an interest in Write Out Loud the blog site of author and freelance writer D K Powell. D K Powell (known as Ken to his friends) is a British freelance writer. He began writing for fun back in 2009 while living in Bangladesh. He came with his wife and kids to the country to do charity work and Ken took up a post in the local school as an educational consultant. Living in the middle of nowhere meant a lot of free time and it was perfect opportunity to take courses, read books and generally learn how to write – and (more importantly) actually get ‘out there’ to do the writing! Ken began went full-time as a freelance writer in 2013 and since then has had many articles, reviews and posts published around the world in a variety of journals, magazines, blogs, newspapers and newsletters from America and Europe to India and China. His credits include: Little India, Paste magazine, Cumbria magazine, Magicseen, G & L Review, Windsong (in-house publication of the Windamere Hotel), The Congregationalist, The Doughnut, Funds For Writers, Writers Bucket List, Black box Warnings and many, many more. He is a journalist and reviewer for the Egremont 2Day and contributes regularly to United Airways in-flight magazine Welcome Bangladesh. Ken is also a senior writer for Xiaoduo – the publishers of China’s most popular science and lifestyle publication for teenagers. See Samples of my work for published clips. Ken has also edited books for many clients, and contributed chapters to more educational Science books than he cares to remember. His clients in the business world include World Trade Press, Volkswagen, Kia and many small businesses in the UK where he provides ghostwriting services and case studies for their websites. 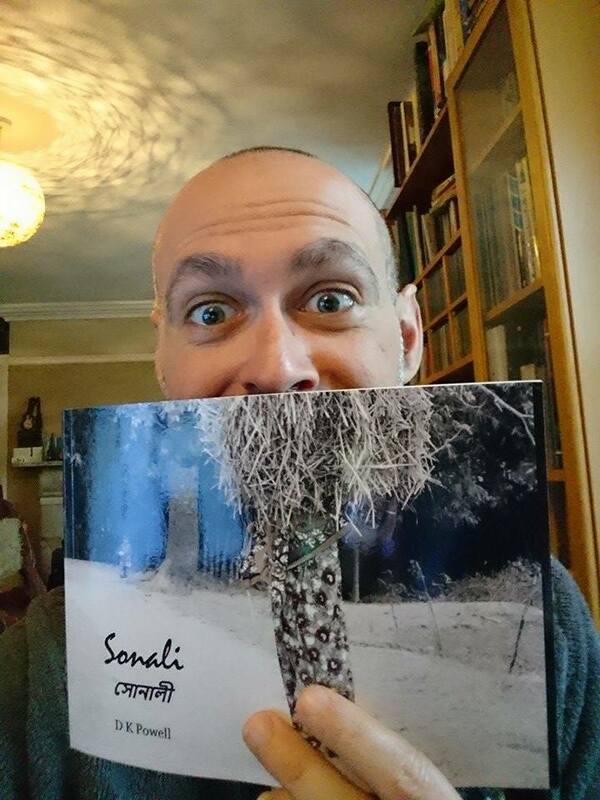 Ken’s first book, Sonali, is now out and you can buy it by clicking on the link at the top right of this blog. His collection of short stories is coming out shortly (watch this space!). His second, The Old Man on the Beach and other stories, is now also available and you can find multiple links to it on this site. D K Powell started his teaching career in 1992 as a private music teacher and after getting two degrees in the subject then went on to become a classroom teacher in 1998. From 2008 he began teaching Science, Maths, History and Computer Studies in Bangladesh while completing a second Masters degree from the UK. He still intends to finally get an ‘open degree’ in Science and Maths in the future, and Ken’s fingers are still clinging on to the ever-decreasing cliff-ledge of hope that he might just get a PhD before he dies. He and his family returned to the UK at the end of 2013 and since then Ken has continued writing with an ever-increasing list of satisfied clients. Maybe you’ll be one of them! Look forward to reading The Pukur – what name is it published under? If you mean which publishing company that should be Ariel Media, although there have been delays and that may change in the near future. No, I meant your name so I can put it down on my Good Reads To read list! It will probably be published under the name Ken Powell though that will depend on the publisher’s wishes in the end.